On her last Christmas, my mother performed a miracle. She produced a Christmas dinner for 14 people on an ancient anthracite stove in the kitchen of the farmhouse I'd recently moved to. The stove was a blue-enamelled Esse. It was fuelled each day by two scuttle-loads of anthracite, one in the morning, one in the evening. It had to be vigorously stoked and voided of spent coals before the fresh fuel could be poured with a raucous clatter into the burner. The stove was not only our cooking hub — it also heated water for the kitchen and bathroom. We weren't farming types. Our new home — necessitated by my husband's job on a nearby nickel mine — was a novelty for us all. 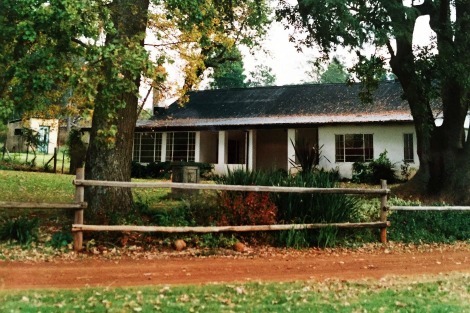 It was a sprawling, century-old homestead set in a beautiful valley 250 km east of our hometown. Its front garden was planted with trees whose initials spelled PEACE: pine, elm, ash, cedar, elm. It went without saying that Christmas would be held at ours' that year — the first my husband and I had ever hosted. But how to produce the usual festive fare on this lovely but anachronistic stove? The week before Christmas my mother rang me on the farmhouse's party line (the stove wasn't the only archaism we had to contend with) and asked me to measure the oven's dimensions. She took the measurements to a homewares shop and bought two roasting pans that fit the space snugly. On Christmas Eve she arrived on my doorstep with roasting pans, Christmas pudding, turkey, ham, gifts, two grandmothers and my father in tow. The electricity had tripped — a regular occurrence on the farm, especially when it thundered. We lit candles and lanterns, waited for other family members to arrive, and held a cheese and wine soiree there in the gloaming. Then my mother got down to business, setting up a cooking station on the bench alongside the Esse, laying out knives and peelers and graters, assessing my woeful collection of serving platters, calculating how long it would take to roast the turkey and glaze the ham, wondering how to keep the mounds of potatoes and pumpkin hot, the way she liked it. She set up the hot tray she'd brought with her, and hoped that by morning the electricity would be restored so she could plug it into a live socket; it was rude, she felt, to serve dinner on unheated plates. On Christmas morning, after the gifts had been opened and a breakfast of mince pies eaten, my mother took her place at the Esse. She wore, as always, a knee-length dress and heels and lipstick. Her kitchen armour — a dainty pinny — protected her from food spatter. She chopped and pared and grated, seasoned and glazed, issued directives — but preferred, really, to do things herself, because she was a perfectionist and never quite trusted anyone to follow her instructions faithfully. Nothing could distract my mother from the preparation of this Christmas lunch on a stove that was built last century — except for the pain that had been growing for some months just beneath her ribs. As she stirred the stock and pressed cloves into the ham I saw a wave of discomfort wash over her. It was uncharacteristic, and unnerving. My mother had never taken pain relievers; she seldom got sick and never complained; she was an efficient, capable, confident, positive person who got on with things. She'd seen her GP a few months earlier and he'd given her medication for an ulcer. But the pain hadn't gone away. By some miracle, that day my mother served up a perfect — hot! — Christmas lunch on perfectly hot plates. The meal might well have been cooked in her own kitchen, on her own modern, spacious stove: the turkey was moist, the ham glazed to perfection, the potatoes crispy on the outside, fluffy on the inside, the pumpkin cooked until its sugars had caramelised but not burned. For dessert we ate the Christmas pudding that, months earlier, she'd steamed for a full day and left to mature. We didn't know it at the time, but that would be my mother's last Christmas. The meal cooked on that old anthracite stove would be a final dedication to the family she loved so much. A few weeks later she was diagnosed with pancreatic cancer; she died at home on 15 October 1997, aged just 58. I have no memory of my very first Christmas without my mother — except that my father tasked me with making the Christmas pudding. Perhaps the memory couldn't crystallise because we were all still in mourning; perhaps we were allowing ourselves to heal before picking ourselves up again and — in my mother's own feisty, inimitable way — getting on with things. Thank you - this is beautifully written. Your love for your mother and her love for her family shines through. How I envy that brilliant earthy literary style. My forte was in classical Greek [Honours] French, Hebrew and Latin[lingua franca of the seminary] with ironically very very ordinary pass in English in Leaving Certificate [despite a Cambridge grad English teacher]. My Greek teacher failed Uni exams-that humble admission contrasted with the haughtiness of our Cambridge don- inspiring inferiority, unlike my humble, ever encouraging, Greek teacher-now tragically a Dementia case;;the Don'[ RIP] leaving a litany of Uni professorships [Sic Transit Gloria Mundi]. Thank you for the reminder Cath. Mommy truly left a legacy and I'll never forget the wonderful memories at 'yours' before be after that Christmas.